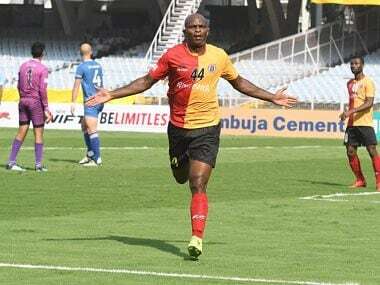 Kolkata: East Bengal's title aspirations got a major boost as the Kolkata giants recorded the biggest victory of the season with a 7-1 rout of Chennai City in an I-League encounter, riding on Dudu Omagbemi's four-goal burst. Dudu scored in the 32nd, 49th, 56th and 61st minute respectively, including season's first hat-trick with East Bengal climbed upto second position with 29 points from 16 games -- two behind NEROCA, who are still on top with 31 points from 17 games. Minerva however are also on 29 points but have played a match less than East Bengal. After the victory, East Bengal have opened up the league but much of the credit would go to Gokulam FC, who defeated both NEROCA and Minerva to give Khalid Jamil's men, some much-needed breathing space. With 29 goals and a difference of 13, East Bengal also have done their chances a world of good if it comes to a photo finish. In what was a must-win game, East Bengal were spectacular right from the start against a sloppy Chennai defence as they went three-nil up in little over half an hour's play that included an own goal from Dharmaraj Ravanan (23rd). Mahmoud Al Amna (20th minute) drew the first blood in what was a big defence let down as the Syrian was seen scoring from a third attempt in a tussle with goalkeeper Kabir T.
The Chennai defence was caught napping as Al Amna's first two shots were blocked by Thaufiq but he got a third time lucky to chip it into the open net. It was goal glut in the second-half when Dudu completed his hat-trick and went on to fire in his fourth, before substitute Gabriel Fernandes completed the rout with his 84th minute strike. Mashoor Thangalakath (59th) scored the solitary goal for Chennai City as the southern outfit coached by V Soundarajan found themselves staring at relegation. 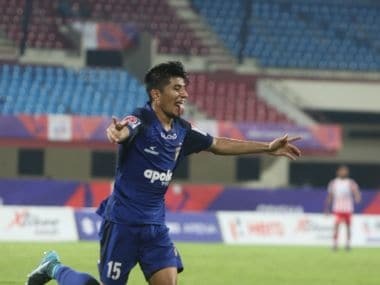 If the first goal was not enough, Chennai City's defence once again let them down when Ravanan found his own net in an effort to clear the ball from Brandon Vanlalremdika. It was time for Dudu to make his presence felt, beginning with the easiest of the goals when he found himself in front of an open net as he slotted it in, before giving a relaxed pose to the crowd. One hoped Chennai to regroup after trailing by three goals at half time but there seemed to be no respite from the goals and the Nigerian continued his onslaught. It's his combination with Al Amna again that yielded a goal as Dudu finished with a flourish from his powerful right footer for his brace of the day. Thangalakath produced the sixth goal of the match and it was some respite for Chennai as he scored from a lovely cross in by Jean-Michel Joachim. It was time for the first hat-trick of the season, when Dudu was set up by Ansumana Kromah who combined well with Al-Amna to break the defence and nick a pass to the Nigerian to do the rest. Gabriel outside the box and he shot a curling one into the right corner behind Kabir as Chennai completely lost the plot.